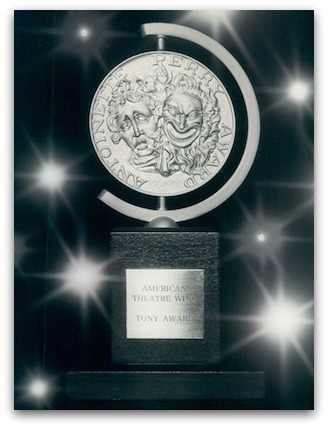 I look forward to seeing the Tony Awards on television this weekend. Tony Awards celebrate Broadway, so let’s celebrate the musicians who have been a big part of Broadway’s success: the pit musicians! These hardworking instrumentalists create the surging rhythms and rhapsodic melodies audience members tap their feet to, and then go home humming. I got a small taste of this life just a few years ago, when I played a five week run of the Broadway touring production of Wicked in Las Vegas. I so enjoyed getting to know the inner workings of this great musical production from the perspective of the pit musician. The show is almost three hours long. The musicians have lots of notes to play, performing eight shows a week. The weekends are especially brutal—shows Friday night, Saturday afternoon, Saturday evening, Sunday afternoon and Sunday evening. This is an exhausting schedule for anyone, and I just did it for five weeks. So I want to “rejoicify” (a word from Wicked’s script) about the Broadway pit musicians who work these schedules for weeks on end, even for years. Playing in a pit requires excellent musicianship, not just playing notes accurately, but also having a keen awareness of how your part fits into the whole, a skill equal to playing great chamber music. And there’s also the skill of keeping the music fresh sounding, maintaining a groove and an emotional connection despite the tedium of playing the same show night after night. And then there’s the sitting. What was a bit “confusifying” (another Wicked utterance) for me about the experience was how hard it was just to sit for that many hours. It was confusifying because I’ve spent a lot of time working on how to sit comfortably, and I even teach others how to sit better, yet I found myself hurting at the end of that first long weekend of playing Wicked. My back ached. A few years earlier I was made aware that one side of my pelvis is slightly shorter than the other. Not all pelvises are equal. My left side is shorter than the right (verified by x-ray). By placing a book under the left side, I even myself out, and sitting becomes more comfortable. Because of this, when I sit at my office desk I put a small paperback book under my left side in order to avoid discomfort. I’ve never done this when I play in an orchestra, because I don’t usually sit for more than a couple of hours at a time. So during Wednesday night’s performance of Wicked I put a paperback book under my left side. And that did the trick. I was able to get through the rest of the run of the show without any more pain or discomfort from sitting. Now that’s something to rejoicify about! Playing for so many hours while sitting (fifteen hours on weekends) forces one to find the optimal place for sitting. The optimal place is just one that allows you to find freedom. A place that allows for micro-movements: movements of ribs, movements of muscles in the stomach and pelvic floor, movements of the spine–forward, back, lengthening and deepening. Sitting is never static. Finding comfort when sitting should not be about finding a good sitting position. There isn’t one perfect position for sitting, because we constantly move as we sit. The ideal way to find comfort when sitting is to properly map what you are sitting on. In order to best deliver your weight to the chair, and find good alignment above the chair, you must sit on your rockers. The rockers are the base of the pelvis, often called the sitting bones, or sitz bones (see illustration below). 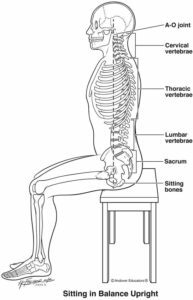 Many people think they sit on their legs, or they sit on their tailbone. But sitting on the legs or the tailbone will not allow you to find freedom. Freedom comes from finding the security of balance over the two rockers. Legs and feet play a role in sitting, but not quite what you might think. 80-85 per cent of sitting is about sitting on the rockers. Legs add only the last fifteen percent of security, but that last fifteen percent can make a big difference when you are sitting for very long periods of time. And what your legs are doing often affects other things. If your legs seem short compared to the chair, then you might put books or a block of wood under your feet. Long legs might require putting the books under your rockers, or even bringing your own, taller chair. When I have to quickly juggle two instruments (oboe and English horn), one instrument sits in my lap while I play the other. Because of the slant of my legs, I worry the instrument could fall off my lap, so my feet hike up against the legs of the chair, thus raising the angle of my thighs making them more parallel with the floor. This makes the instruments seem more secure. But then I start feeling discomfort in my back. So I noticed how my lower back was responding to having my feet hiked up against the chair. The muscles of my lower back were tensing up. I noticed my spine was starting to arch forward and my legs were quite tense. When I asked all this tension to go away (releasing the arch in my spine), I realized I could sit with my feet and legs in the same position, but without the extra tension. And my back felt comfortable again. The tailbone is the base of your spine, but it is also part of your pelvis, slightly above and behind the rockers. Its position will affect the curves of the spine above it. Just above the tailbone the lumbar vertebrae gently curve forward bringing the front of the spine into the center of the abdominal region, aligning with the hip joints. I notice that when I bring the lumbar spine to center, rather than forward of center, or back of center, then the weight delivery through the rockers to the chair is more secure, and my breathing gets easier. I am centered. It is pretty simple to develop sensitivity for the tailbone’s position, once you put this on your kinesthetic radar. This awareness will profoundly affect your sitting, as well as your breathing. When this is right, and your lumbar spine is centered above the hip joints, then you can more easily engage the pelvic floor muscles, which play a supporting role in breathing. I’ve written a lot more about how to find a good sitting position in my Oboemotions book, but I’d like to offer one final tip for pit musicians. When you aren’t playing music, then use movement to release excess tension. If you’re in view of the audience you can’t move a lot, but there are subtle movements you can get away with doing that can make a world of difference. Do simple spinal twists from side to side. Shrug your shoulders up and down, and roll them forward and back. One of my favorite things to do is to just lean forward, resting my elbows above my knees. I like to hang out in this “dugout position,” releasing tension in my neck muscles while observing my breathing. I especially like the sensation of breathing into the back that this position enhances. I then slowly find my way back to upright sitting, using my head to lead the spine, one vertebra at a time, back above the rockers. Playing Wicked helped me develop an even greater awareness of how I sit, and this awareness allowed me to feel like I was “defying gravity.” The changes I’ve made to how I sit have positively affected all aspects of my performance. I discovered that playing a Broadway show like Wicked could change me. For good.